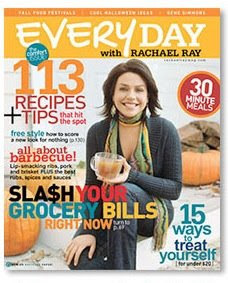 You know I love a good 30 minute meal (duh) and the October 2008 issue of Every Day with Rachael Ray does not disappoint. You'll find recipes for Smoky-Spicy Sweet Potato Soup, Grilled Eggplant Subs with Mozzarella and Tomato Jam, Curry Pepper Beef with Smoked Almond Pilaf, Mushroom Not-Potpies with Cheesy Parmesan Crust, Lemon Chicken Not-Potpies with Poppy Seed Crust, Ground Beef Not-Potpies with Caraway-Salt Crust, Creamy Saffron Farfalle with Crab and Shrimp, Pasta with Hazelnut-Spinach Pesto, Bacon-Wrapped Salmon with Broccoli and Mashed Potatoes, and Veal and Olive Ragù with Pappardelle. This month's No Recipe Zone feature has a recipe that I may not be able to pass up - Buffalo Chicken Fingers. Mmm. The Mucho Gusto feature by Daisy Martinez shows us how to make Serrano Ham and Chicken Croquettes. The Burger of the Month is Lamb Sausage Burgers with Feta Tzatziki. Not sure if I could pull of a lamb burger, but I'll have to think about it. If you are looking for a good kid recipe, you'll find one in Maple Sausage-Stuffed Apples. How good does that sound? You can also make your doggie happy by making Gulliver's Goblin Stoup. The magazine also features a horoscope-themed party with recipes for Shrimp-and-Artichoke Dip, Gnocchi with Braised Mushrooms and Peas, Individual Chocolate Silk Pies, Champagne Cocktail, and Mint Julep Hot Toddy. I have the mushroom not-potpie w/parm crust on my list to try. I LOVE this magazine. I'm thinking of trying the lemon chicken one because it sounds so interesting.